In concert with our School-wide Behavior Expectations - Be Safe, Be Respectful, Be Responsible - all adults and students on campus will practice strategies for stopping inappropriate behavior in a positive, consistent manner. This research-based program includes a 3-Step Response supported by Supervisors and Teachers to help students "Expect Respect" and stand up to inappropriate behavior for themselves and others. "With the entire school speaking the same language and responding with Stop, Walk and Talk consistently, we can nip bullying in the bud. Adults will also know how to respond to students and reward appropriate behavior, just as we have done with our school-wide behavior expectations over the past four years," says Mr. Torrecampo, principal. 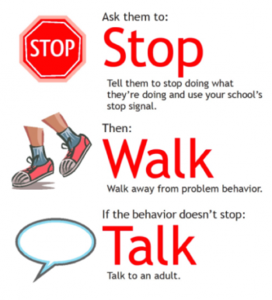 If you would like to learn more about Stop, Walk, Talk, please contact Mrs. Hale, Coordinator of PBIS/Positive School Climate at lhale@robla.k12.ca.us or by calling (916)756-7086.